Gigi gives us the boot! This fall, Stuart Weitzman has collaborated with Gigi Hadid, the face of the Fall 2016 ad campaign, on an exclusive design for the brand -- the Gigi Boot. The hiker-inspired high heel combat bootie was co-designed by the social supermodel and reflects her sleek street style and fashion-forward flair. Hadid was inspired by the brand’s stellar boot reputation, but used her creative vision to put a unique, personal spin on the lace-up bootie silhouette. The Gigi Boot is set on a stacked heel, boasts bold metallic eyelets accented by duo-toned laces designed to wrap around the ankle and is finished with a detailed collar. 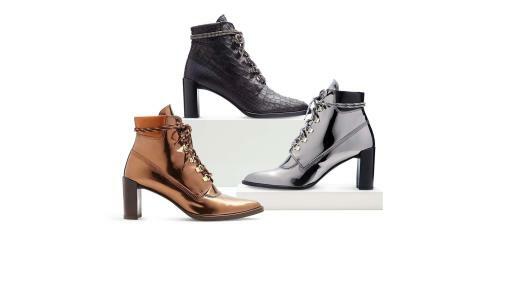 The bootie is available in three materials, so there are multiple options for her style squad: a classic-yet-modern nero soft croco-calf leather and two shiny chic metallics, including iron specchio and copper glass. The bootie comes in a signature Gigi Hadid box and is available exclusively at Stuart Weitzman retail locations and global websites. The retail price is $565 for the metallic styles and $598 for the nero soft croco-calf version. A short film directed by James Franco and starring Hadid, titled #doitright, will kick off the Gigi Boot’s global retail debut on www.stuartweitzman.com. Shot at Brooklyn’s iconic Gleason’s Gym, the dynamic film features Gigi as “the champ,” as she jabs and moves around the boxing ring, dominating every opponent – all while wearing the Gigi Boot. Art imitates life in the film, as the boxing concept was inspired by Hadid’s real-life workout regimen – and, like the global advertising campaign, it captures her power, agility and gracefulness. The energetic visuals are enhanced by the upbeat soundtrack “Do It Right” by Martin Solveig and Tkay Maidza. The Gigi Boot not only looks amazing, but helps do amazing things. Her design is a celebration of the Stuart Weitzman partnership with Pencils of Promise, a financial commitment this fall 2016 season to build three schools: one each in Ghana, Guatemala and Laos. With a focus on creating quality elementary education programs within the rural regions of developing nations, the Stuart Weitzman and PoP partnership takes a step closer to the vision that every child has the basic right to education. Stuart Weitzman, a global leader in designer footwear, operates 78 retail stores across the United States and in Europe. The brand is also sold through licensed international stores and international shop-in-shops, fine retailers and specialty stores and e-commerce sites in the United States, Canada, Europe and Hong Kong. Stuart Weitzman footwear and accessories are sold in more than 70 countries.